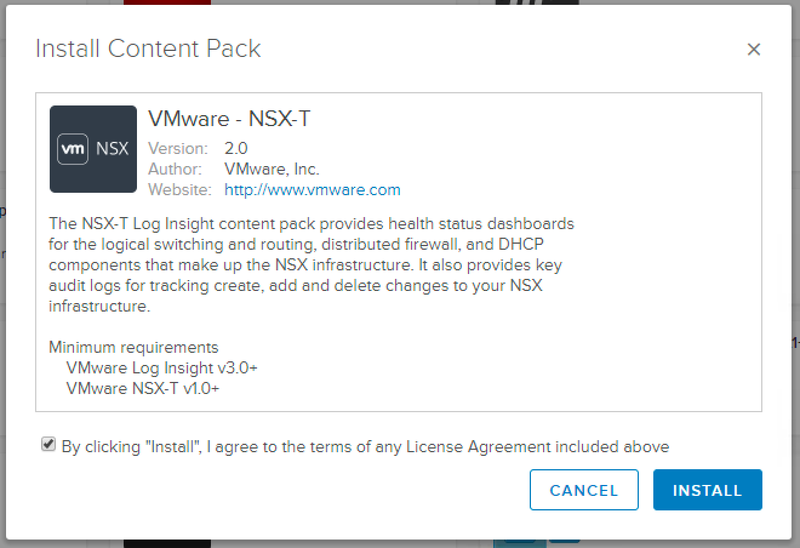 So, what is this NSX-T Content Pack doing for you exactly? The NSX-T Log Insight Content Pack provides operational and alerting visibility for different sources of log data within NSX-T. The graphically rich content pack is essential for analyzing and identifying NSX-T configuration, performance, security and traffic related issues and makes it easy to act upon the information provided. The Content Pack covers NSX-T functions such as audit information, logical switch, logical router, Firewall traffic, DHCP and represents the information via custom dashboards, filters, and alerts. The seven NSX-T dashboards sort information based on user defined time intervals and the data is presented graphically via bar graphs, pie charts and raw data collection widgets. The setup instructions to forward all required logging components (NSX Manager, Controller, Edges, etc.) to Log Insight are provided in the content pack. More resources: NSX-T Log Insight Content Pack on VMware Solutions Exchange.